If you want to find evidence of Pennsylvania’s long history of oil and gas drilling, a good place to start is in Laurie Barr’s back yard. Behind Barr’s house, a few rusty pipes stick out of the ground, abandoned entry points to wells drilled long ago. Until recently, Barr had no inkling that abandoned wells could be dangerous. She decorated one of the pipes in her backyard with a bird feeder. Then Barr heard about a how a house in Bradford, McKean County, blew up. State regulators centered their investigation of the 2011 incident on gas from an abandoned well, drilled in 1881, located about 300 feet from the home. Ever since, Barr has made hunting down abandoned wells her life’s calling. She read every study about abandoned wells that she could get her hands on. She began studying old property records and hiking through woods to find abandoned wells. Earlier this year, she launched an online “scavenger hunt,” encouraging others to look for wells, and pass along their locations and information. The state Department of Environmental Protection can use the help. Across northern and western Pennsylvania, an estimated 200,000 abandoned wells are unaccounted for. The underfunded state program in charge of finding and plugging those wells has identified only 8,255 of them. The information gap is a problem, because abandoned wells are dangerous. The energy industry has a compelling reason, too, with all the new drilling going on in Pennsylvania. Active drilling operations don’t often cross paths with an old well, but when they do the results can be dramatic. In Tioga County this summer, a well Shell was drilling is believed to have interacted with an abandoned well drilled in 1932, producing a 30-foot geyser of gas and water that sprayed out of the ground for more than a week. Yet the whereabouts of the vast majority of these old wells remains a mystery. Time has marched on in the decades since the wells were first drilled. Trees and brush have covered their holes. Scrap collectors have pried metal casing – often the most obvious sign of a well’s presence – out of the ground. And towns and cities have been built on top of them. So finding old wells can require a good amount of forensic work. To find one, you can employ high-tech radar or use a musty antique survey map. Whatever method you choose, it’s going to be a time-intensive effort. Historic, aerial photos can help, too. Pennsylvania’s Department of Conservation and Natural Resources and Penn State University have created an online database of aerial photographs called Penn Pilot. The oldest series of pictures was taken in 1937, a time when oil and gas drilling was booming in western Pennsylvania. Parrish spearheaded the efforts to put the database of aerial photos online. The pictures come from the U.S. Department of Agriculture. They’ve been in the state’s possession for decades, and were housed in “a very nice library at the geological survey,” explains Parrish. “But you had to physically get them, or get them mailed to you.” When Parrish became Pennsylvania’s top geologist, he pushed to digitize the photographs, and publish them on a public website. The project was funded by royalties generated from drilling in state forests. In the search for abandoned wells, the PennPilot database has its limitations. Drilling had been going on for nearly 80 years before the first photos were taken. By 1937, towns had been built and land had been reclaimed over thousands of wells. So if you really want to find abandoned wells, you need to get out into fields and forests and look for them. That’s where Laurie Barr comes in. The environmental activist says most people in Bradford are familiar with the area’s long experience with energy drilling — the local McDonald’s has a brown pumpjack in its parking lot, producing oil from a 140-year-old well. But they know less about all the wells that were hastily abandoned when the oil or gas played out. “You don’t know,” Barr says. 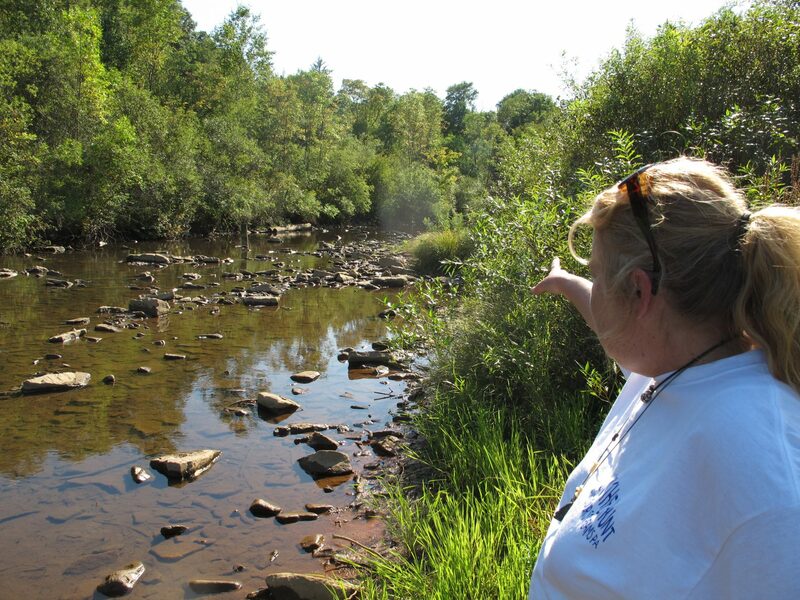 “You haven’t heard of methane migration and you don’t think of the wells still being there.” These wells are a major problem in the area near Bradford: the Department of Environmental Protection’s database of known abandoned wells lists more than 3,000 in McKean County alone. Some stand out though, if you know where to look. South of Bradford, near the Allegheny National Forest, Barr pulls her van to the side of the highway and climbs up a steep embankment and into the woods, to show me an abandoned well. It’s a jagged, rusty pipe sticking out of the ground. “Depending on the pressure underground, or the water table, this pours with water,” Barr says. The Department of Environmental Protection knows about this well, but won’t be plugging it any time soon. That’s because well-plugging funds are limited, so state regulators triage their list of wells. If an old well isn’t near a water source or people, it will likely stay unplugged.